Here's where I will show all Boards in my game. This area has been a power source for the Mushroom Kingdom for a very long time. Unfortunately ~ Bowser want to claim all of that generated power for himself! Hurry! We need to get the Power Stars keeping the generators up before Bowser can get his claws on them! Takes place in a huge power field that supplies power for the Mushroom Kingdom. 4 Pipes that are connected by a huge pipe junction in the center. Landing on the ? spaces or paying 5 coins at the event will cause the pipes to lead to different areas. There are also green pipes that players can hop into to travel to different areas, as well as avoiding Bowser. Green pipes are the only way to reach the area with boo (without a reverse mushroom) and the Bowser Zone. All mushroom items you own are usable - use at our own risk! You must try to collect as many goods as you can by landing on as many spaces as possible. You will always roll a 1-10 dice block unless you have something that says otherwise. Before you roll, you are allowed to either use any mushroom item you own, or you can end the game where you stand. You also receive a free Poison Mushroom within entering the game, allowing at least a choice. (In center and near entrances of pipes on sides) Changes which pipes the 4 pipes on the sides lead to. 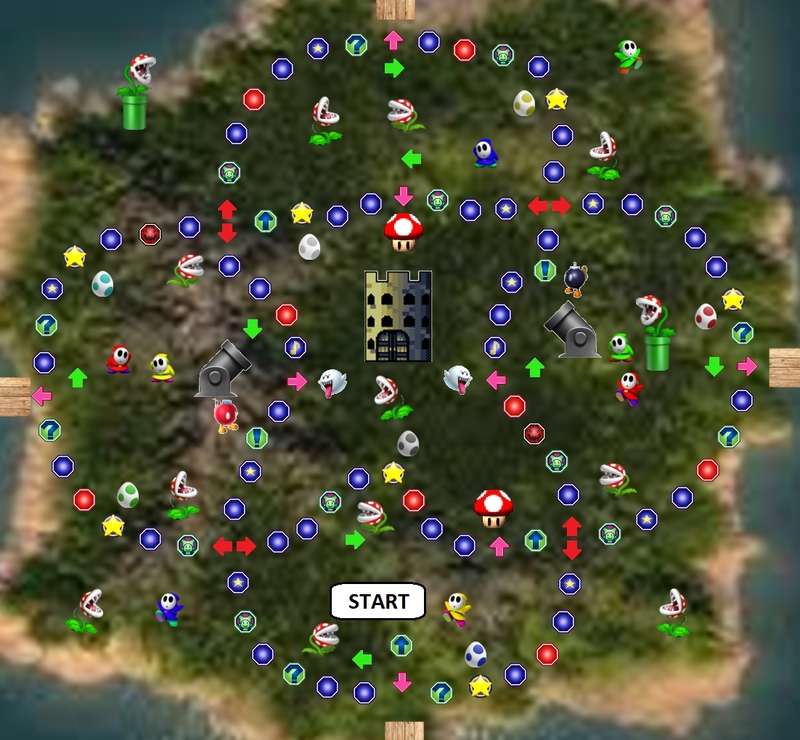 (Those by green pipes and in Bowser Zone) Enters the pipe on that turn, and pops out of another the next (Red circles). Enters the pipe on that turn, and pops out of another the next (Red circles). Also ends the turn of the player, counting it as landing on a ?/! space. This mansion, won by Luigi once before as a trap, is King Boo's secret hideout. Recently, King Boo has been stealing Power Stars from various locations and has been storing them here. Tonight's the night that he will present these stars to Bowser as a gift. Quickly ~ we must take these stars back before King Boo can present them! Takes place in Boo Woods, where a strange mansion that once day just appeared out of the blue. Divides into 4 separate rooms surrounded by hallways. Landing on a ? space or by paying up to 10 coins at the event will cause the mansion to go under a quick renovation, swapping the positions of the rooms and all contents inside, including the star space, character spaces, and characters themselves. Of course, if the star space or a character is in a room when it's changing places, the room will never be swapped out with another. Also, the amount of coins you pay at the event will determine how much the rooms will shuffle.
! spaces can also be treated as just junctions here since you can continue moving after you activate it, although Ghost Shrooms do prevent the player from making a choice here. Simple as such - pick a path you think will earn you the most income. Reaching the end of any stage will earn you a star - just note the lengths of each one, though. The top path can earn you the most income if you can make it near the end, although you require landing on the dash space to do so. The middle path earns you coins depending on your roll, so the higher the better, although it earns less coins than the higher path in total, but a shorter path. The lower path gives you all the coins right from the start, but bob-ombs will get in the way later on and take them away from you. You'll always be rolling a 1-10 dice block, and the game will end once your move ends, although you can keep going if you land on a dash space. (All those in the hallways) - Shuffles the 4 rooms around at random. Travel to the or that's on the other side of the wall. If you chose to stop here, you will continue your move afterwards. Takes place deep within the Dry Dry Desert. Instead of the typical star space, 3 chests will appear instead - each costing 10 coins to open upon passing. They contain either 5 coins, a bob-omb (which will send you back to start), or a star. Using a Magic Lamp will always lead you to the chest with the star. Upon opening the one with the star, 3 new chests will appear, replacing the old one's locations. The tombs around the area are completely random - they can help, harm, or even warp you to any other tomb. Paths leading from the giant Chomp Rocks to the start are hazardous - if said rocks activate in the path you are in, or you're in the middle path leading back to the start, the rock will chase you and everyone else back to the start space. (Near the tombs) - The tomb will open up. Coins, enemies, or items may pop-out, or there could be a portal within that warps you to another tomb. (In the pathway of the chomp rocks and above) - The Chomp Rock will start rolling downwards, chasing everyone in it's path, including yourself (if in said path), back to start. The Chomp Rock will start rolling downwards, chasing everyone in it's path, including yourself, back to start. Rumours have been recently been going around about hidden Power Stars within an island beside Yoshi's Island - the home of the Yoshi's. Bowser has taken wind of this, and as such has been terrorizing the place in hopes of finding such stars! The locals need help! Aid those Yoshi eggs and kick Bowser off the island! Takes place on a small island right near the infamous Yoshi's Island. 7 Yoshi Eggs are scattered throughout the island - invest coins into them to become the guardian of it and earn a star-rating. If another player is the guardian of an egg, you can take guardianship by investing more coins than them into the egg. If enough coins are invested into a egg, it'll hatch! This will increase the star-rating of the Yoshi. Eggs are worth 1 star, Baby Yoshi's are worth 2 star, and Adult Yoshi's are worth 3 star. Using a Magic Lamp will allow you to travel to any Egg/Yoshi you wish to travel to. Boo cannot steal stars in this board - instead he is able to steal coins directly from the Yoshi's for a cost of 10 coins. If you steal from a Yoshi, you can also choose which person's account you want boo to steal specifically from, or you can choose from anyone in general. If you have Bowser's 100% Anti-Boo Repellant, you can choose to use it to prevent a boo from stealing any coins from your account after someone has made an attempt to steal anyone's coins, resulting the boo in not taking anything from your account only. Boo tends to steal less coins from a one player's account than one person in general, but he still steals the same amount overall. It is possible for a guardian change to occur with the change in totals by a boo. The events are all docks - when passing you can pay a dolphin 5 coins to travel to a near-by dock, or 10 to cross the island.
? spaces will also lead you to these events if you land on them. You fall into the water, where a dolphin saves you can takes you to a dock at random. The bob-omb offers to take help you by shooting you across the island to anywhere you want. Without giving you a chance to respond, he puts you into the cannon and shoots you off to any Egg/Yoshi around the island, so you can visit it next turn.